Today is the first installment of our “Spotlight on Districts” series, in which we will be delving into the unique and special qualities of Bhutan’s Dzongkhags. With recruitment nearing for 2014 teacher placements, we thought it would be informative to give our future teachers a look into possible areas they could be teaching, highlighting features of specific districts along with stories from past teachers in that area. 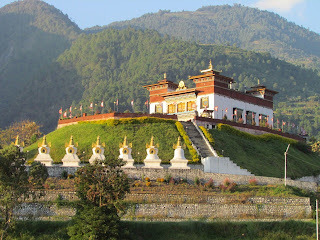 Trashigang is known for its breath-taking views; seen here is Rangjung Woesel Choeling Monastery. Photo Credit: Vicky & Ian. This week’s district is the Trashigang Dzongkhag in the heart of Eastern Bhutan. This remote region is at the foot of steep wooded valleys and is one of the largest Dzongkhag in the country, having the densest population in Bhutan. The main market of Trashigang is home to a handsome collection of shops, bars, hotels and small restaurants. The climate is warm and equitable, and the area is rich in tropical crops and fruits in which locals are dependent on these agricultural activities for their livelihood. Trashigang is home of the protected Sakteng Wildlife Sanctuary, which was created to protect the Migoi, or more commonly the Bhutanese Yeti. In Trashigang, Rangjung, a fairly new planned town and one of the warmest places in the district, is home to two schools, Rangjung LSS, a separate school for pre-primary to grade 8 students, and Rangjung HSS, a boarding school for students from grades 9 to 12. Ian Swift and Vicky Chartres, two of our 2011- 2012 teachers taught at these schools. 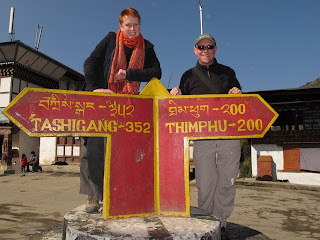 Ian and Vicky discuss on their blog their most favourite things about their district and schools, noting their passion for teaching and experiences with the Bhutanese educational system. The students, according to Ian and Vicky, were a wonderful blend of innocence, motivated curiosity and diligence in which they both became very fond of their home classes. Other schools in the district include Kanglung Primary School, in which Ashley Huffmon began teaching in 2012 and is currently living and teaching for the 2013 year in the heart of Kanglung in the central village. Ashley reflects on how “living” has changed her life forever, in which she lives in a small apartment in the Upper Market of Kanglung in Trashigang. Read more from Ashley at her blog Huffmon in the Himalayas. Another teacher in Trashigang, Nick Morris, who taught at Khaling HSS, says the essential qualities of successful teachers in Bhutan depend on one’s flexibility: Be flexible. Flexibility is absolutely imperative in this culture. Schedules can change entirely with absolutely no notice. Living conditions can vary depending on your location and luck. Adjusting to a new education system can be extremely frustrating at times. You must keep in the mindset of “going with the flow”. Trashigang is just one of the districts our teachers are placed in so stay tuned for more District Spotlights! Read more about the district and schools at the above teacher blogs and be sure to keep your eyes on our live application date, opening May 1st!